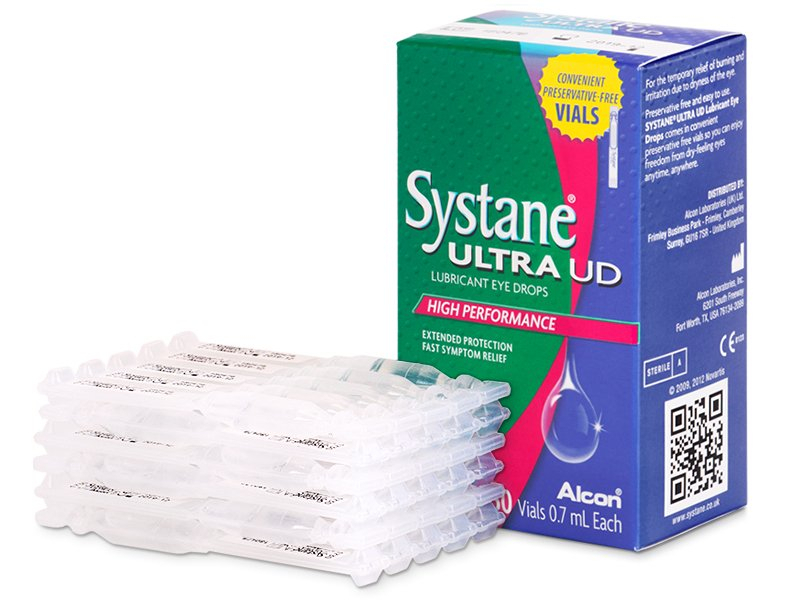 Systane ULTRA UniDose are eye drops which effectively relieve feelings of discomfort associated with dry eye syndrome. They are able to moisturize the eyes without the addition of any preservatives, making them ideal for frequent use. This packaging contains 30 single-use droppers. This kind of single-use packaging is extreme hygienic. Any other small bottle of eye drops is always at risk of being contaminated. Here, every droppers is replaced after use so every dose is guaranteed to be sterile. These Systane ULTRA drops come in 30 droppers, each containing 0.7 ml of solution. This is more than enough for 1 – 2 drops in each eye. Although these drops do not contain preservatives, the manufacturer Alcon does not advise using these drops directly on contact lenses. Remove your lenses before applying, and let the drops work for a while before putting them back in.